hovering over the edge of ripeness. half the night with their own new babies. Only the rickshaw quiets him. to the din and rev of traffic. of getting a family of five on a motorbike. then, finally, his first laugh. of the few trees we pass. on the bed holding him against my chest. holding off a world so unalterably shifted. Poem by Laura Horn from "Ordinary History." 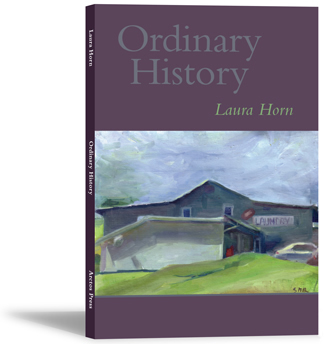 Laura Horn calls her volume of poems Ordinary History. Yes, it is history of a family, of lives on the edge and of lives well-lived; yet there's nothing ordinary about this book. Horn has a gift for intimacy, for nuance and lyric. Her voice is both earthy and spiritual. This is a book to read slowly and savor.